The age old debate of real tree versus artificial tree has officially been decided and the artificial tree wins for many reasons. 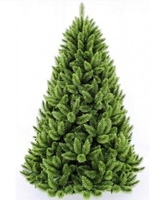 There are many significant advantages / benefits in purchasing an artificial Christmas tree. Starting with the obvious, that the trees will not wilt and die so you will have a beautiful looking Christmas tree right through to Christmas day and for many years ahead. No more watering the tree and messy needles dropping to the floor. Like the smell of a real Christmas tree? That is even covered with the Christmas tree scent sprays now available. In times of Australian drought you will be pleased that you have been able to assist the environment by saving on water and leaving the trees in their natural habitat. Bearing in mind that as your natural tree dries out it becomes more of a fire hazard, whereas the artificial tree is fire retardant and lowers the risk to the safety of your family. The convenience of an artificial Christmas tree should not be overlooked as it can be stored in the strong box it is delivered in and erected whenever the urge overtakes. No longer do you need to call on the services of a tree lopper to cut a tree to bring home or run around trying to source a tree that has been legally cut in an environmentally friendly way, but can simply open the box and erect the tree. After Christmas there is no trying to shove the tree in the bin or compost, you simply pack it back into its box for next year. The use of an artificial Christmas tree will result in cost savings to you over the life of the tree. Whilst the upfront cost may appear high you will not outlay every year for a new tree which will result in more money in your pocket for the important things like presents under the tree. All of the artificial Christmas trees sold by Father Christmas carry a manufacturer’s warranty so you will have peace of mind should there be any breakages to your tree. The Artificial Christmas tree is also easier to decorate and will stay looking amazing right up until Christmas night when the festivities have ended. Compare this with the frustration of a live tree with branches dropping and decorations having to be constantly rearranged. You can achieve perfect spacing with your Christmas lights and decorations to achieve a truly professional looking Christmas tree. The design of our artificial trees are based on real live Trees from all regions of the globe to create an exceptionally real looking artificial tree. The Appalachian Mountains of North America provide the inspiration for one of our most popular trees, whilst the Bavarian is aptly named for its German origins. The Edinburgh for a Scottish feel, the Salzburg from Austria or the Californian Ponderosa, whatever your origins you can have an artificial Christmas Tree that takes you back to your own Christmas traditions. Whatever your style Father Christmas has an artificial Christmas tree to suit. All of our trees are sturdily made and backed by a manufacturer’s warranty. They look natural and will remain lush for years to come. Why not have a look at our range and decide for yourself.